Zucchini, like tomato, has been often mistakenly taken for as a vegetable. It is in fact a type of fruits belongs to the species Cucurbita Pepo which includes pumpkins and cucumbers. Zucchini is low in calories because it has high water content (water takes up 95%). There is approximately 17 food calories per 100 g fresh zucchini. For a medium-size zucchini, it contains around 31 calories. It is a perfect food to consume if you are concerned on calorie intake. Raw fresh zucchini with skin on is packed with vitamins and nutrients our bodies need daily. One medium size zucchini delivers 58% amount of vitamin C we need daily, 15% potassium and 8% magnesium, among other vitamins and minerals. Have you ever eaten raw zucchini? Raw zucchini, freshly harvested from the garden, will make an excellent summer salad. It adds a refreshing crunch taste to the traditional green salad. 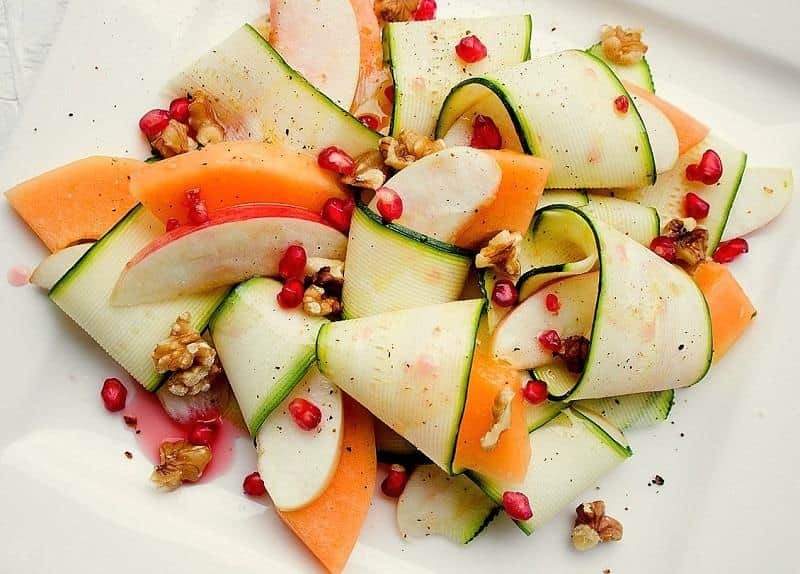 To add flavor, try to mix zucchini slices with apples, melons, pears, any of your favorite summer/fall fruits. This salad plate makes a great summer side salad and will be a featured dish at any cook-out. Mango is one of the summer favorite fruits, not only for its delicious, sweet & luscious taste but also for its immense health benefits. Mango is an excellent source of vitamin A. According to the National Institute of Health, Vitamin A is responsible for immune function, vision, reproduction and cellular communication. It also supports cell growth and plays a critical role in the normal formation and maintenance of the heart, kidneys, lungs and other organs. 100 g of fresh mango provides 765 IU or 25% of recommended daily levels of vitamin-A. It is also an excellent source of vitamin-C and vitamin-E. These vitamins in mango give it the power to fight infectious diseases, boost immune system and anti-aging factors (because of the Vitamin A, C & E helps to produce collagens). Consuming raw mangoes also promote brain health and alertness because the abundant amount of vitamin B6 (pyridoxine) inside mangoes. 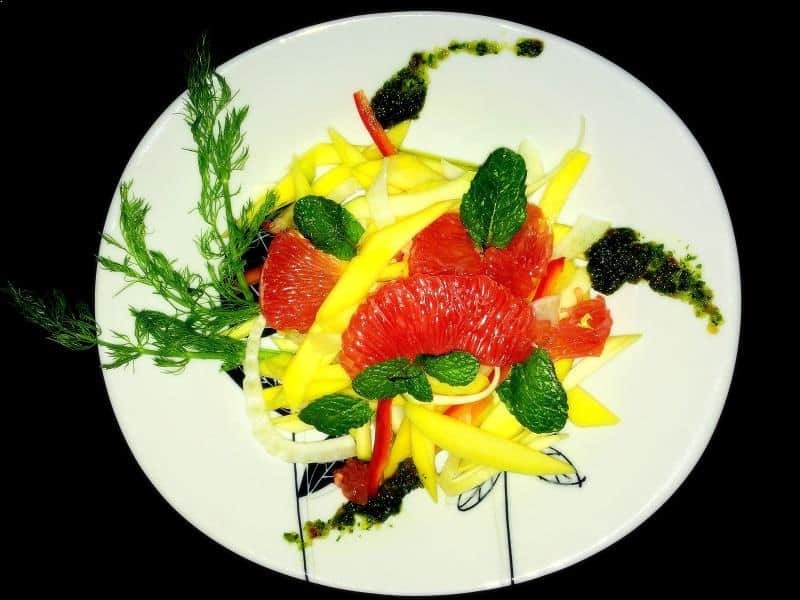 For these listed benefits and more, when mangoes are in season, enjoy a fresh plate of this mango salad to give your body and your mind the nutrients they need and at the same time you’d be satisfied with a great starter salad for your meal. This tropical fruit salad plate is so refreshing on a hot summer day. It pairs very well with any grilled meat. 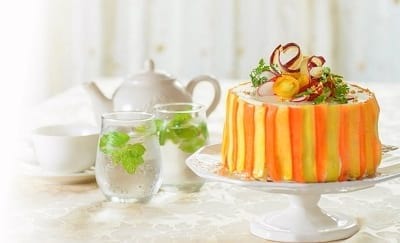 In our areas, we can find ripe but firm mangoes almost any season, so this fruit salad recipe is a year-round favorite dish. The crunch of the mangoes added with the citric tangy taste of grapefruits will awake your sense for a great start of any meal. Persimmons are like apples in the Eastern of Asia. It should be consumed only when it is ripe. Hachiya persimmon is ripe when it is super soft, almost gushy like a water balloon. Cinnamon, Fuyu or sweet pumpkin persimmons are ripe when they are still firm but skin color turns golden. Persimmons are a rich source of dietary fiber. There are 3.6 grams of fiber in 100 grams fresh persimmon. Fiber-rich food helps the gastrointestinal system work well and prevent constipation. Persimmon also contains polyphenolic antioxidants such as gallocatechins and catechins and another powerful antitumor antioxidant called betulinic acid. These compounds have anti-hemorrhagic, anti-inflammatory and anti-infective features. Other antioxidants are vitamins A, lycopene, lutein, beta carotene, cryptoxanthin, zea xanthin etc. This dish is not quite the traditional fruit salad recipe. It can be used as a starter, an appetizer. 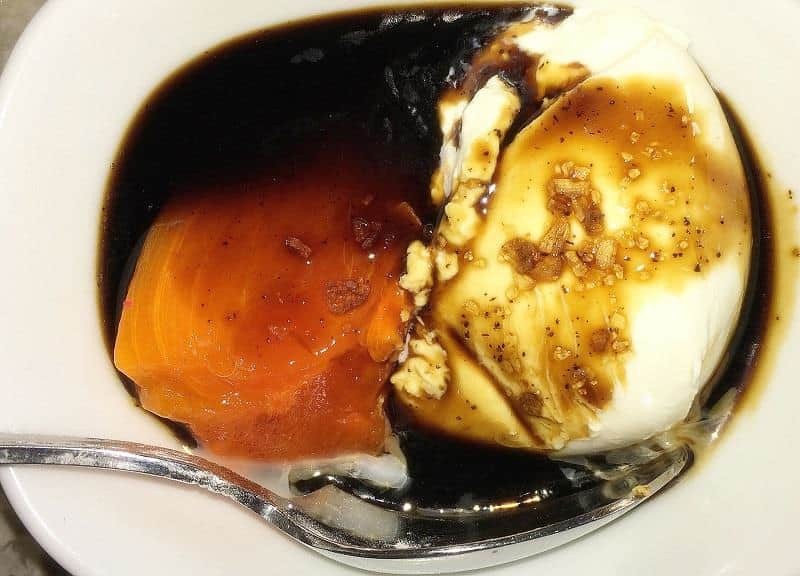 The sweetness of a ripe Hachiya persimmon complimented by the tangy, sour taste of the balsamic glaze and paired with the smooth, melt-in-your-mouth texture of Burrata cheese just awake all your senses. This easy yet exotic and full of nutritional appetizer recipe requires only a couple minutes to prep but it will be a crowd-pleaser for sure. 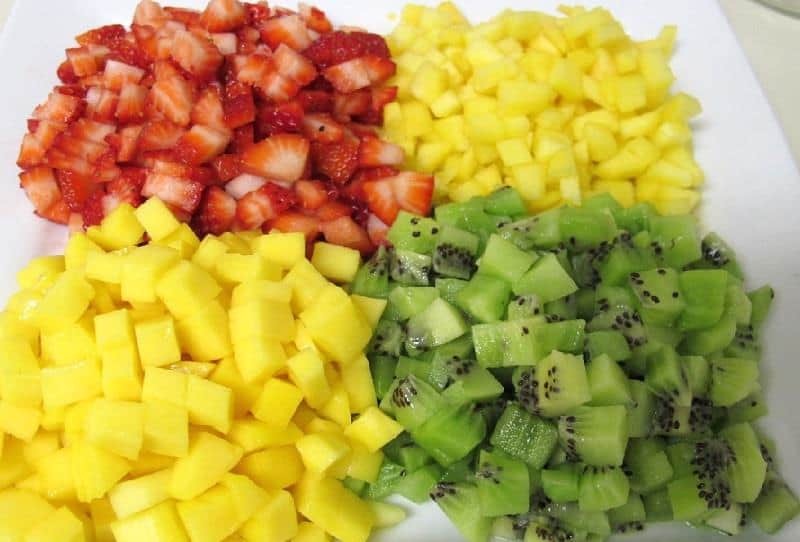 One of the easiest fruit salad / appetizer you can make just in a few minutes of prep time. And yes, technically tomato is a type of fruits. 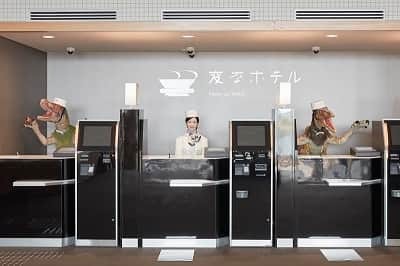 But in the kitchen, we treat tomato as vegetable because of its lack of the sweetness and strong flavor of a fruit, it is commonly used in savory dishes. Tomato is a very versatile fruit to use in cooking. It can be used as salads, appetizers, sauces, juices and soups. It is one of the healthiest fruits/vegetables there is, especially for heart health. Tomato with its deep red or orange color contains high concentration of a natural carotenoid called lycopene. According to National Institute of Health, there are enough evidences to support the role of lycopene to prevent cardiovascular diseases (CVD). Lycopene also support bone health and prevent osteoporosis. 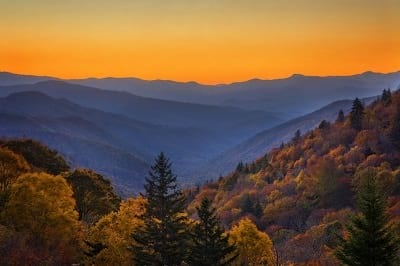 In a study published by the National Institute of Health, “Protective effect of total carotenoid and lycopene intake on the risk of hip fracture: a 17-year follow-up from the Framingham Osteoporosis Study”, older adults who consume food which are high in carotenoid have less incidents of hip fractures and non-vertebral osteoporotic fractures. 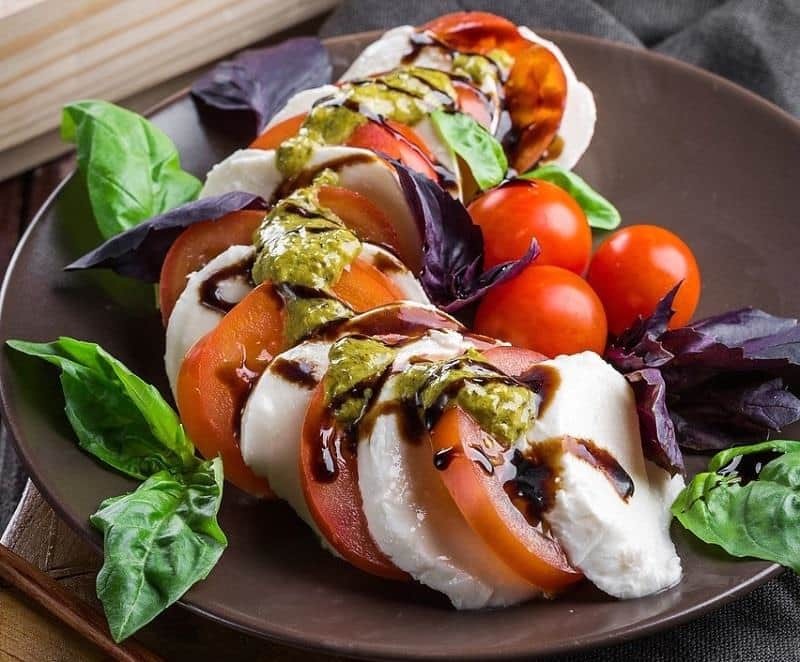 This full-of-nutritional-wonder caprese salad is super easy to prepare. Lycopene and cardiovascular diseases: an update. You might have heard this saying “eat an apple a day to keep the doctor away”. This saying is not far from the truth at all. Apples are rich in flavonoids and antioxidants to promote heart health. Apple is an excellent source of soluble fiber, which helps to slow down digestion and the craving for more food, also helps with digestion. 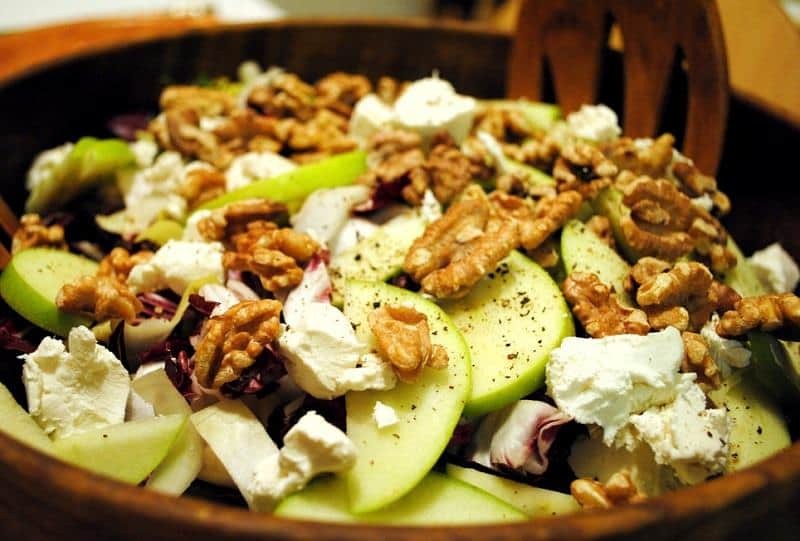 According to the reports lead by researcher Francis Raul, PhD, research director of the French National Institute for Health and Medical Research in Strasbourg, France, the natural fiber in apples ferments in the colon, it produces chemicals that help fight the formation of cancer cells. Apples contain quercetin, a powerful antioxidant that protects brain cells from degeneration in rats and might do the same in humans. Eat the skin to get maximum disease-fighting compounds. The immense benefits of apples are undoubtedly ranked at the top of the fruit chart. However, apples are prone to insects, worms and scales so they are sprayed with lots of pesticides. To get the full benefit of an apple, we should eat the skin and not just the meat inside. So in order to avoid the harmful pesticides to our bodies, it is advisable to get organic apples, or to thoroughly wash and immerse the entire apples in a tub of salted water for a long time to wash off as much pesticides as you can. When it comes to healthy fruits to eat, majority think of apples right away and overlook the sweet, buttery soft fruit like pears. In fact, pears are just as much healthy and nutritional as apples. Pears are considered as hypo-allergic fruits which are less likely to produce allergic reaction. It is a safe fruit to introduce to infants. Pears are also perfect for keeping your diet and your diabetes in check because they are high in fiber and low glycemic index which makes you feel fuller for a longer time and help control appetite. Like many other fruits, pears contain an abundant of antioxidants to eliminate the free radicals that accumulate in the body following cellular metabolism. These free radicals mutate healthy cell DNA into cancerous cells, and can cause a number of other devastating conditions. Therefore, antioxidant components found in pears like vitamin C, vitamin A, flavonoid compounds like beta-carotene, lutein and zea-xanthin can seriously help rid the body of these dangerous compounds. Chickpeas (Garbanzo beans) are high in insoluble fiber so it can help you control your craving for food, which in turn keeps your weight gain in check. Chickpea is an excellent source of protein, a perfect protein choice to lower your bad cholesterol (LDL) level to prevent heart diseases. 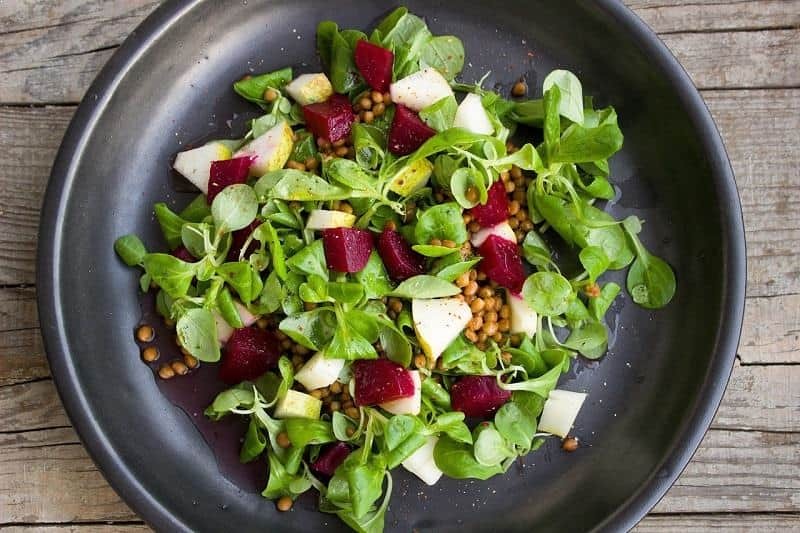 These 2 main ingredients for this salad is like a plate of good health you can give to your body to prevent and combat diseases. Do you tend to exercise more during the summer and get muscle aches? 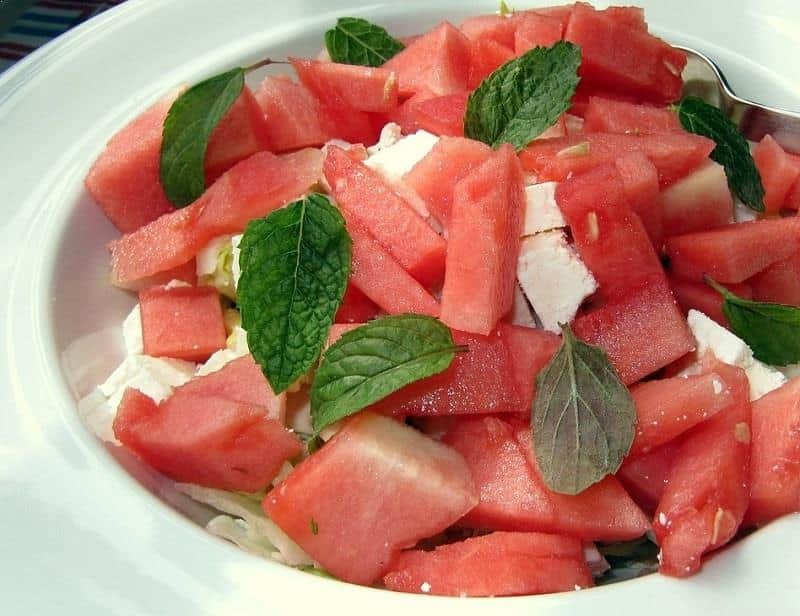 We have a perfect salad to cure your muscle aching, watermelon salad! According to a report on watermelon juice by Journal of Agricultural and Food Chemistry, watermelon is a fruit rich in an amino acid called Citrulline. Citrulline helps to reduce muscle soreness. Also, watermelon promotes cardiovascular health, especially for postmenopausal females. In an article published by National Institute of Health, citrulline and arginine containing in watermelon improve arterial stiffness and wave reflection amplitude in postmenopausal women. This refreshing juicy fruit salad has a 5-star rating for your health. Peaches are available in many different sizes, and their colors range from yellow to red, and their skins can be furry or smooth. Despite the varieties, peaches are great sources of beta-carotene. According to an article on Beta-carotene published by Medline Plus, Beta-carotene is used to decrease asthma symptoms caused by exercise; to prevent certain cancers, heart disease, cataracts, and age related macular degeneration (AMD); and to treat AIDS, alcoholism, Alzheimer’s disease, depression, epilepsy, headache, heartburn, high blood pressure, infertility, Parkinson’s disease, rheumatoid arthritis, schizophrenia, and skin disorders including psoriasis and vitiligo. Beta-carotene also improves eye heath and reduces the risk of sunburn. 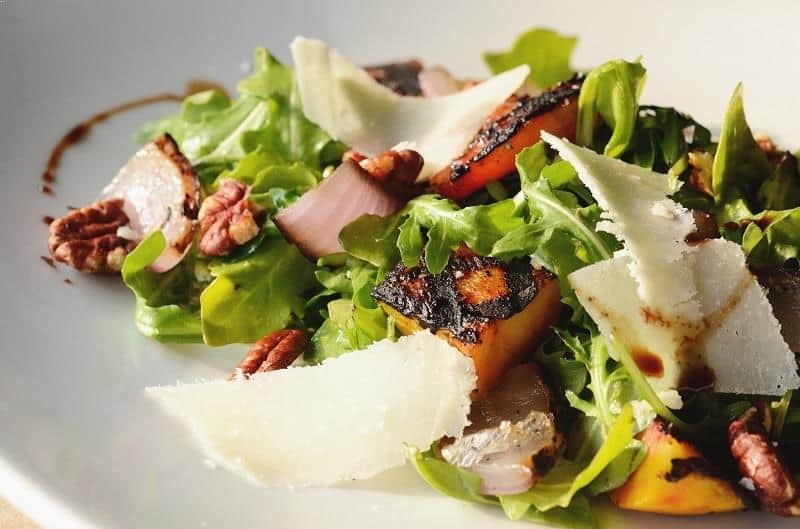 This roasted peach salad mixed with greens would go well with any grilled meat at a BBQ party. Mangoes contain large amount of polyphenols which help fighting free radicals and protecting against cell damage. Mangoes also contain high levels of flavonoids like beta-carotene and alpha-carotene, which help protect against oral cavity and lung cancers. With a high concentration of vitamin A, vitamin B6 in mango, consumption of mangoes help improving eye and skin health as well as brain development wellness and health. 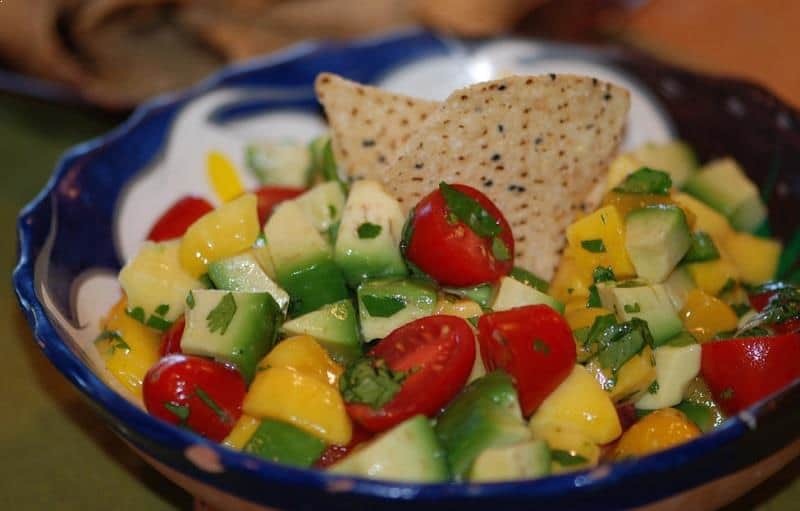 This salsa recipe also calls for another super nutritious food, avocado. Even though one medium-size avocado can pack with 210 calories but its other health benefits outweigh the high calorie count. Avocado contains vitamin A, vitamin E, vitamin K and minerals like potassium, magnesium, iron, copper, zinc to boost metabolism and help you burn those calories quickly. Avocado also contains high level of monosaturated fat to help regulate blood sugar levels and fight against heart disease, cancer, cognitive decline and many other disorders. This bowl of salsa is the gift of health you can present to your guests at the start of any party. You might have to keep refill the chips. Each fruit offers a wide range of health benefits to our bodies. Salsa is a great way to mix a varieties of fruits together to create a savory bowl for dipping. A combination of fruits would only increase the vitamins, the minerals, and all other health compounds found in those fruits to give you and your loved ones a nutritious dipping snack or salad in this savory and colorful bowl of fruits.